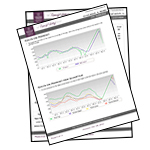 The KoenigRubloff Report is an exclusive weekly electronic real estate trend and analysis tool detailing Chicago-area neighborhood and community market trends, provided to you by KoenigRubloff Realty Group at no cost! Whether you are buying or selling a home, or just want to stay current on the real estate climate in your area, the best decisions are made with up-to-date information. Reports contain real time market data and are emailed directly to you every week, and can be customized based on towns or zip codes as well as property type. What is the average number of days on market in my area? What are prices like in a particular town or neighborhood? Are there many homes on the market in my particular price range? What is the average square feet of homes in my town? To see sample reports, please select an area below. To sign up and customize The KoenigRubloff Report, click here. If you have questions, please give us a call at 866.795.1010, or contact us here. For media inquiries, please contact Liz Dominello at ldominello@KoenigRubloff.com or 312.268.2749.